Tottenham bounced back from their shock 3-1 loss against Wolves with an impressive 3-0 win away to Cardiff City on New Year's Day. Harry Kane, Christian Eriksen and Heung-Min Son were on target at the Cardiff City Stadium as Spurs moved back up to second in the Premier League table ahead of Manchester City's meeting with leaders Liverpool, live on Sky Sports on Thursday. From Kane's continued excellence to Tottenham's title credentials, here are three talking points from an important win for Mauricio Pochettino's side. Kane made more Premier League appearances than any other player in 2018. Thirty-five out of 38 were starts and he completed the 90 minutes in all but six of them. Throw in England's run to the World Cup semi-finals and Kane's workload could hardly have been heavier. Still, though, the 25-year-old shows no signs of slowing down. His goal against Cardiff was his 14th in the Premier League this season - putting him level with Pierre-Emerick Aubameyang at the top of scoring charts and moving him to 18 in all competitions. He has now found the net against every one of the 28 Premier League teams he has faced. Kane's five goals in four games over Christmas make this his most prolific run of the season, but his performance against Cardiff showed he has become much more than just a goalscorer. He only scored once but he had a hand in all three of Tottenham's goals. His opener, a ricochet off Cardiff defender Sean Morrison, owed a lot to good fortune, but the chance would not have arisen at all if not for his own fine work in the build-up. It was Kane who turned smartly away from Aron Gunnarsson near the halfway line before feeding Kieran Trippier to cross. He played a similar role in the second, dropping deep once again to slide an inch-perfect pass down the same flank for the onrushing Moussa Sissoko, who helped work the ball to goalscorer Eriksen, and Kane followed that up with the assist for Tottenham's third, releasing Son to fire past Cardiff goalkeeper Neil Etheridge. "It's very easy to look the goals he scores, but he's an all-round footballer," said Sky Sports pundit Graeme Souness afterwards. "He's got a great picture when he drops deep and he gets on the ball, and he's got the technique to deliver on it." It was another productive evening for Son, who, like Kane, has been in outstanding form lately. He has now scored five goals and provided three assists in his last four Premier League appearances, taking him to eight and five respectively in just 1012 minutes of action this season. Son's strike rate of a goal every 124 minutes is superior to Kane's and puts him behind only Arsenal's Aubameyang and Manchester United's Anthony Martial among players to have played at least 500 Premier League minutes this season. It is all the more impressive when you consider he rarely plays as an out-and-out striker and it underlines just how much Spurs will miss him when he goes to the Asian Cup with South Korea later this month. The 26-year-old has agreed to miss their first two group fixtures, meaning he will be available to face Manchester United, live on Sky Sports on Sunday, January 13, but he could miss Premier League meetings with Fulham, Watford and Newcastle as well as the second leg of their Carabao Cup semi-final against Chelsea after that. The significance of his departure will not be lost on Pochettino but the Spurs boss insists they will cope. "We knew very well that that is going to happen," he told Sky Sports. "Of course he has to go with his national team but we have players. Football is always about the squad and we are surely going to find a solution." Pochettino said he would rotate his side against Cardiff after the defeat to Wolves, insisting he needed to "add some energy to the team", so it was surprising there was only one alteration to his starting line-up as Ben Davies made way for Danny Rose at left-back. The decision was vindicated as they blew Cardiff away with the three early goals. 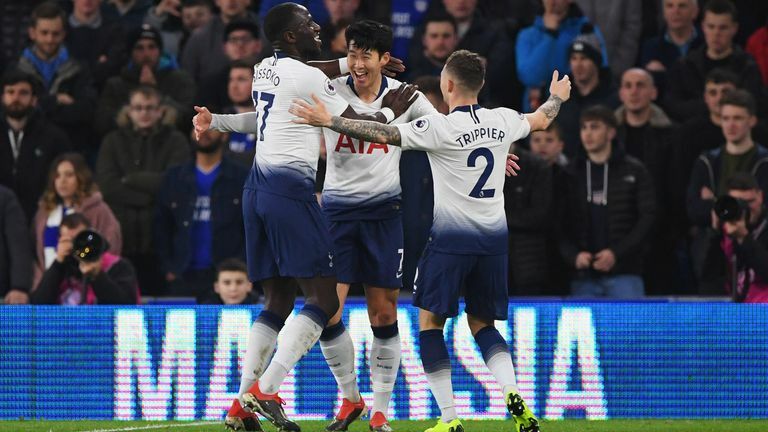 While Spurs tired against Wolves, their one-goal lead proving insufficient as they ended up empty-handed, their commanding advantage at the Cardiff City Stadium allowed them to take their foot off the gas and play out the second half without much incident. Some will question whether the reluctance to rotate two days on from that game at Wembley will come back to haunt Pochettino, but it is now almost two weeks until they return to Premier League action against Manchester United and victory against Cardiff was paramount. With only a six-point gap to Liverpool, it might just have kept their title challenge alive. "Definitely," said Souness. "Only have the season is gone, so most definitely. There was a little hiccup against Wolves which would have concerned the manager, but he got a reaction tonight. They got a helping hand inside two minutes but I thought they were always going to win tonight." Tottenham's players certainly are not giving up the chase. "We dropped points last week and it felt like we were, like, 18 points behind but we're not far," Christian Eriksen told Sky Sports. "To bounce back today gave us a lot of confidence to go into the rest of the season."